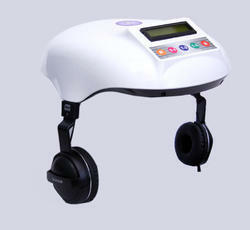 Our range of products include laser hair growth treatment system and laser helmet for hair loss and thinning. DR CURE AND CARE a leading supplier of the laser hair growth treatment which provide through HAIR GROW DEVICE based on FDA APPROVED worldwide uses technology. Which is non invasive, non medication, no pain, and no side effect. Features: Non Invasive, No Pain, No Side Effect. DR CURE AND CARE hair grow device or laser helmet for hair loss and thinning as its name specific product which is control excessive hair loss and thinning. Man and women both can use it. Don't try to see laser red light by naked eyes it harm your eys. Not advisable for during pregnancy. Person may use it togeather with other hair treatment like prp, meso, hair transplant before and after as well as with ayurvedic or homeopathy medication etc. Looking for LASER HAIR GROWTH TREATMENT ?